Catherine Coueignoux is an associate object conservator with an expertise in furniture conservation. In this post from the object conservation lab, she discusses a decorative technique known as marquetry used in the making of an 18th-century French writing table. Ed Ruscha sitting with the materials used for printing the News... portfolio. © Estate of Tony Evans/Timelapse Library Ltd. This Thanksgiving menu is unlike any you’ve had before. It was chosen by artist Ed Ruscha and includes caviar and squid, along with pie filling. Catherine Coueignoux is an associate object conservator with an expertise in furniture conservation. In this post from the object conservation lab, she discusses a how X-rays can reveal otherwise unseen details about how a piece of furniture is constructed. The Thomas Weisel Family’s recent gift of Native American art is comprised in large part of pottery, including rare Mimbres pieces that date back to the 11th century. Approximately 50 pieces of Mimbres and Pueblo pottery will be on view in the upcoming exhibition, Lines on the Horizon: Native American Art from the Weisel Family Collection, which highlights the gift. Pottery presents an interesting set of challenges when being considered for display, especially here in earthquake country. Our team of mount makers has been busily crafting custom-made mounts for each pot slated to go on view when the exhibition opens this Saturday, May 3. In keeping with the collaborative spirit of Matisse from SFMOMA, currently on view at the Legion of Honor, we’ve teamed up with SFMOMA to bring you this blog post, which originally appeared on SFMOMA’s Facebook page. For the first time ever, three prized tapestries from the Fine Arts Museums of San Francisco’s permanent collection will be exhibited together in the Legion of Honor’s Gallery 1. The entire series, known as The Triumph of the Seven Virtues, consists of seven tapestries that depict allegorical representations of the theological virtues—Faith, Hope, and Charity—and the cardinal virtues—Temperance, Prudence, Justice, and Fortitude. While 10 museums in Europe, the United States, and Russia possess tapestries from this series, the Fine Arts Museums have The Triumph of Fortitude, The Triumph of Prudence, and the only extant example of The Triumph of Justice. In 2004 artist Matthew Picton laid a sheet of plastic over the cracks in the asphalt of a playground. 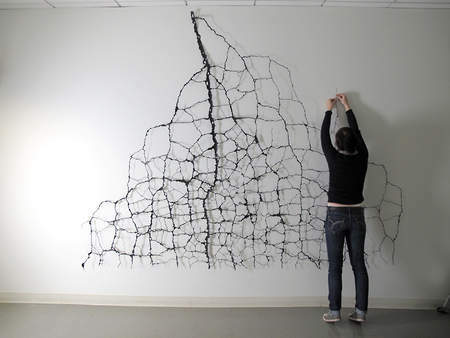 He traced the cracks and painted them with black enamel paint. Then he carefully cut and burned away the plastic surrounding the cracks. What was left was a giant spidery web. 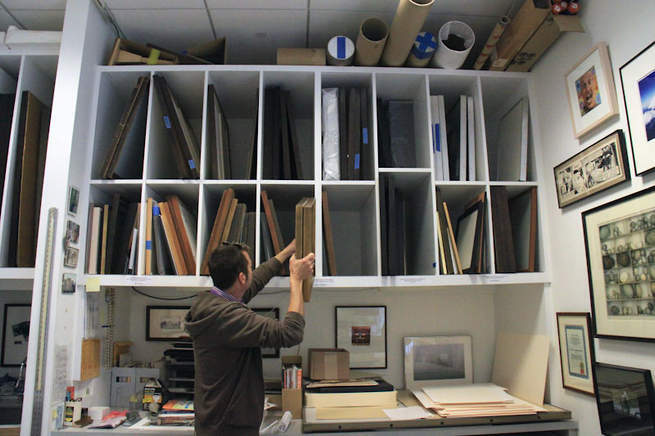 One of the most exciting aspects of working in paper conservation at the Legion of Honor is the variety of objects encountered on a daily basis. When working on a 17th-century print, for example, conservation intern Laura Neufeld faced many traditional paper conservation challenges. Pier Gustafson’s Father’s Suitcase, on the other hand, is a one-of-a kind artwork that required unique treatment solutions. Almost as soon as the Salon Doré was de-installed from Gallery 11 late last year, the comprehensive conservation and restoration project began (and continues today in full view of the public in Gallery 13). Before a single component of the room was removed, however, months of planning and research went into readying the Salon Doré for this massive undertaking. The special exhibition Rembrandt’s Century, currently on view alongside Girl with a Pearl Earring: Dutch Paintings from the Mauritshuis, is striking both in its breadth and for the fact that the works on view all come from the Fine Arts Museums’ permanent collections. Preparations for this exhibition were lengthy, with some works requiring restoration treatments. As the digital media interpretive media fellow at the de Young and the Legion of Honor, my primary role is to digitally document and interpret the yearlong project The Salon Doré: The Conservation of a Period Room, currently underway at the Legion of Honor. Consisting of approximately 250 artworks, Rembrandt’s Century presents a diverse picture of the art and personalities that defined the Dutch Golden Age. Drawn entirely from the Museums’ permanent collection of works on paper in the renowned Achenbach Foundation for Graphic Arts, this exhibition required months of preparation. Curators, conservators, and art technicians worked together to frame—both literally and figuratively—this important selection of masterworks. Objects are fussy. They’re susceptible to humidity, light levels, vibrations, and any number of other dangers, both large (floods) and small (mice). And whether it’s a tiny tea cup or a four-ton bronze statue, each object also has its own idiosyncrasies. Wood, for example, doesn’t get along with water, and paper can’t stand light. A museum is carefully designed, in part, to control all these factors and to give objects the secure and stable home they deserve. 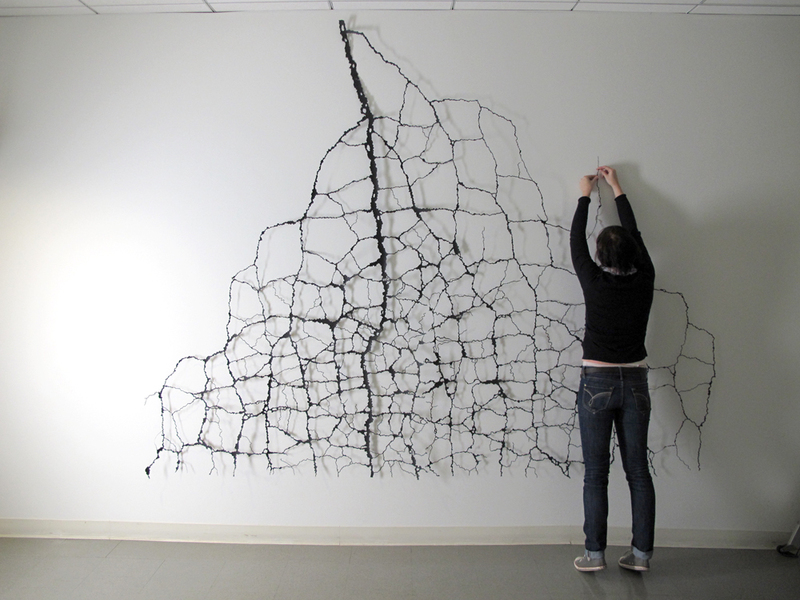 But what happens when an object needs to travel outside the museum’s walls? The permanent collections of the Fine Arts Museums of San Francisco number over 100,000 objects, and only a percentage are on view. However, many of these treasured artworks can be viewed in exhibitions at other institutions throughout the world at any given time. When art objects are loaned in this way, they often travel for long periods of time, which is why it’s so important for our conservators to carefully prepare objects for their extended journeys. 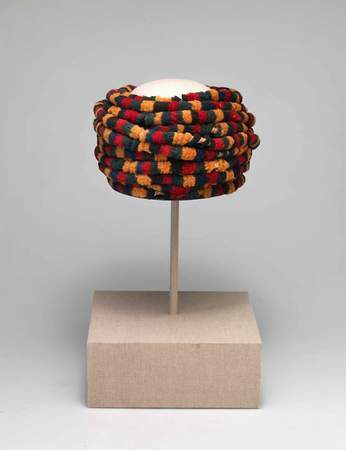 Such was the case when the Cleveland Museum of Art requested to borrow an ancient turban from the Nasca culture of Peru, featured in the exhibition Wari: Lords of the Ancient Andes that opened last week. 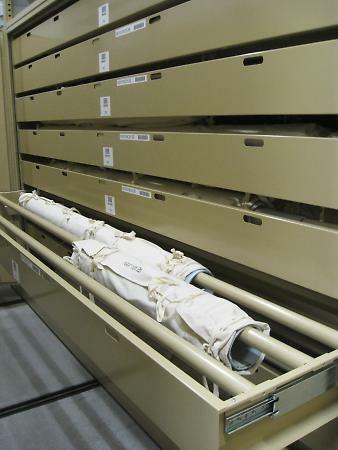 Museum visitors currently have the opportunity to look inside a rare treasure normally kept locked in dark storage. 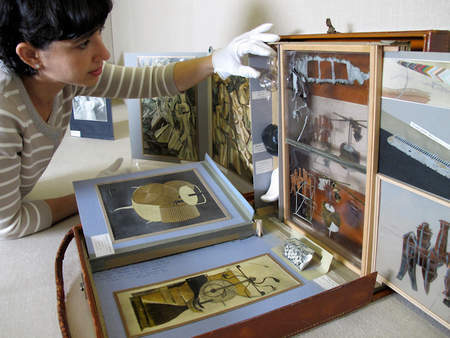 Marcel Duchamp: The Book and the Box, currently on view in the Logan Gallery at the Legion of Honor, features Duchamp’s iconic artwork, Boîte en Valise, which was made in the late 1930s. Recently one of the Museums’ most generous supporters, Dorothy Saxe, purchased a sculpture for the collection in memory of our late director John E. Buchanan. Created by contemporary glass artist Beth Lipman, Candlesticks, Books, Flowers and Fruit (2010) is a complex compilation of multiple elements balanced precariously on a table. My role as an objects conservator is to ensure that all the elements of this fragile sculpture are installed safely and in keeping with the artist’s original intent. Before there were digital image files and even before there was film, photographers captured images on glass plate negatives. 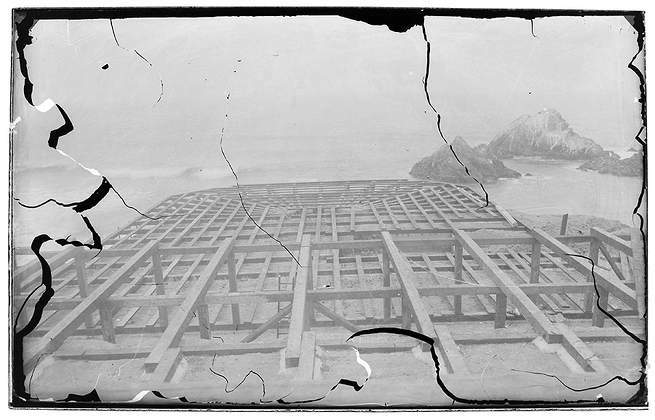 In the collection of the Fine Arts Museums of San Francisco there are over seventy of these glass plate negatives depicting scenes of Land’s End and old San Francisco. 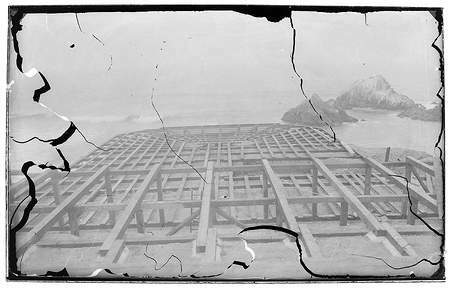 Discovered in the basement of the old de Young, these century-old negatives were in desperate need of cleaning and re-housing. 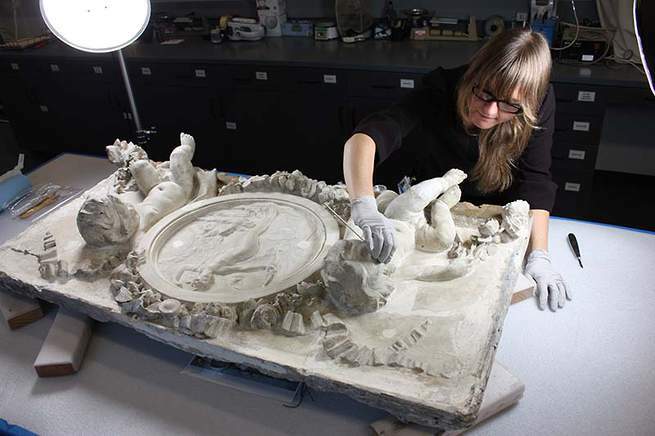 When the negatives came into the paper conservation lab at the Legion of Honor for proper care, the labor intensive project proved a perfect opportunity for pre-program conservation student Jennifer Martinez. The British Aesthetic Movement, which is the subject of the upcoming exhibition The Cult of Beauty: The Victorian Avant-Garde 1860–1900 opening at the Legion of Honor on February 18, promoted the integration of beauty and art into every aspect of life. 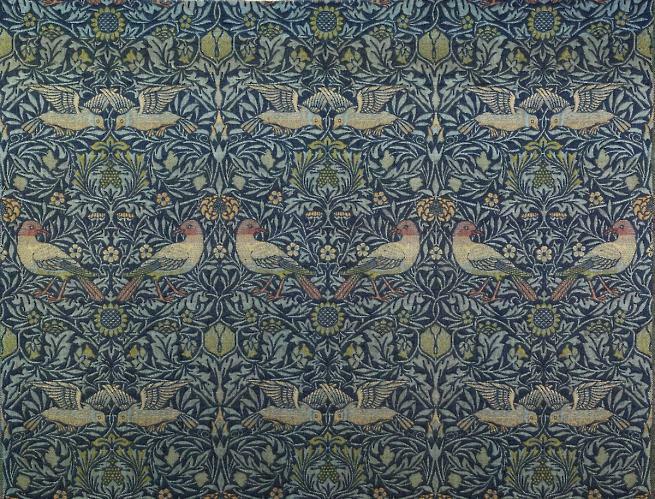 William Morris (1834–1896) was a chief proponent of the Aesthetic Movement and contributed luxe designs for wallpaper, carpets, tiles, and furniture. His career as a textiles designer, however, quickly surpassed his involvement with all other areas of artistic production. In anticipation of The Art of the Anatolian Kilim: Highlights from the McCoy Jones Collection (which opens September 10) the Textiles Conservation team is busy at work preparing each rug for display. It is a meticulous and time-consuming process! First, the kilims have to be taken out of storage. Normal cardboard contains acid that can cause staining on textiles, which is why kilims are rolled onto blue, acid-free cardboard tubes for storage.To avoid harm from dust, the tubes are shrouded in unbleached cotton fabric. Read more about The Kilims Are Coming! For the last several months, Textile Conservation volunteers Kathy Murphy, Jean Scardina, intern Erica Storm and Objects Conservation volunteer Tegan Broderick have all been hard at work making covers for the furniture stored at the Legion of Honor. While most of the chairs were already stored beneath loose-fitting pieces of cloth, custom covers provide the objects with better protection from light and dust. 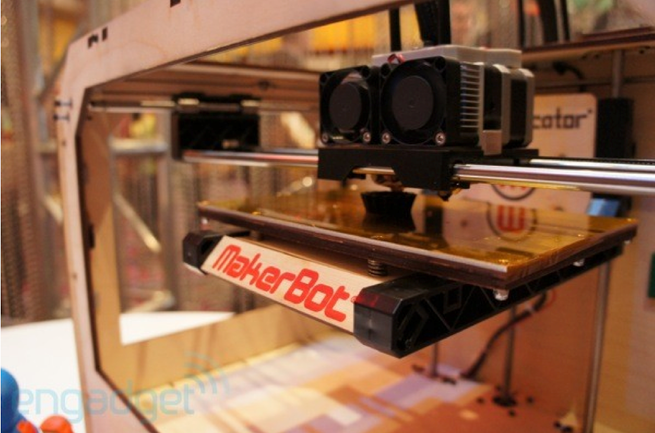 Clearly labeled covers also facilitate quick identification of the objects underneath and prevent unnecessary handling.